There was about the same number of kids who put their names under 230 and 300 and only one put it under 370. The discussions were so valuable because they showed us what they understood (not necessarily correctly understood) or assumed about the task and the math within it. This is such a fabulous way to start the school day -thinking, mathematically reasoning, communicating with each other, trying various strategies to understand others’ ideas. I encourage you to give it a try! Karen told me that at the beginning of the year some students would just put their name wherever without much thought but it didn’t take long before they started discussing and debating with each other and now they really dig into it and feel strongly about their ideas and so want to share. Again, the answers were varied and insightful. Many students used money and shopping as examples of where we use it and one even said weight! Only one student connected decimals to fractions and percentages and could explain clearly what they were. 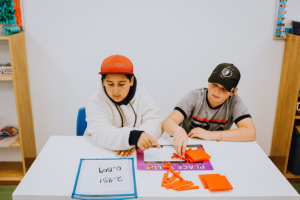 Most of the grade 4 students said they had no idea what they were or what they meant, which is expected because this is their first introduction to decimals. 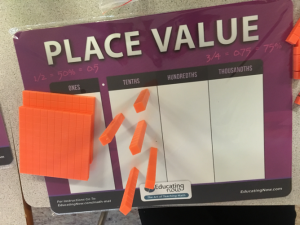 Then, we gave them their base 10 blocks and the Educating Now Place Value Mats and allowed 3 minutes of play-time (more on the Place Value Mats below). From here we followed the introduction to decimals lessons you’ll find on Educating Now. Essentially, we labeled the large flat block as 1 whole and then asked students to name the stick and the little cube and explain why. The place value mats really came in handy to connect the words with the size of the blocks and the symbols of decimals. There is a lot going on when we consider decimal numbers. We are now talking about numbers less than 1 whole but that are still in the base 10 number system. There is nothing about 0.1 that suggests it be called ‘one tenth’ AND one tenth is bigger than one hundredth! All of these can be very confusing for students so we found the mats along with the blocks very helpful for all of us. We also used contexts to help us understand decimals, like sharing an amount of money or food with 10 people versus sharing the same thing with 100 people and money (yes, we used pennies because they are still important). There were some ‘Ah-ha’ moments when we used contexts. I wrote some numbers on the board like 2.5 and 2.05 and students had to create them with their blocks on their place value mats and say it properly using place value language. “Two and five tenths” rather than “two point five”. We discussed why we need to use language and by the end of the class most of the students had a good grasp of it. I noticed at least 4 who were not there yet, however, they were engaged, trying, and working towards understanding. Two students continued to see them as whole numbers, completely ignoring the decimal but the mats and blocks helped us support them in understanding the numbers as decimals. Throughout the lesson I had students stand up to vote for things, or just to indicate that they’d discussed with their partner what I’d asked them to discuss. At one point a student said, “I really like that you keep getting us to stand up and move!”. Movement is so important for learning and it doesn’t have to be a lot of movement to be effective! After I left, Karen continued with teaching about decimals. 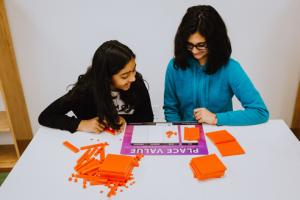 She moved into benchmarking and rounding the decimals to the nearest whole or half (using the blocks and place value mats) and giving the students the numbers in words and asking students to build and write them numerically, for example, “three and sixty-five hundredths”. For the last 5 minutes of the lesson, we reflected on what helped us to understand decimals the most in that class. Most of the students said the mats and blocks and many also said the contexts of money that we used throughout the lesson. Some said working with their partners and a few said writing it down helped them. 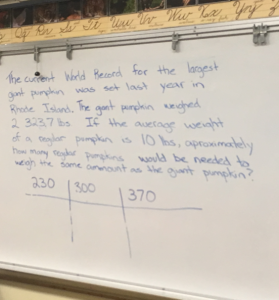 A few students wrote their own notes as they were trying to figure out how to say the numbers but I didn’t instruct them to write anything down for this lesson but hearing those reflections I would definitely do some writing next class. This is the power of reflections! They are fantastic formative assessments that will guide your practice so that you can meet your students’ learning needs best. “I feel so lucky to have been a part of many workshops put on by Nikki over the years. I am pretty certain my class wouldn’t be loving math like they do now if it wasn’t for the learning I have done from Nikki. I am constantly trying to bring in the lessons that I have learned from Nikki, into my classroom and I was overjoyed to have Nikki come into my classroom so that I could see her in action with my class. -Get the students standing when possible. When they have completed their task, either have them stand up or put their hand on their head, etc. -Use tools like a fair jar to call on students (instead of the same students volunteering). Students can say “I don’t know yet”, but they need to know that as a teacher, I will be checking in after to make sure they are trying to figure it out. -Do brain gym activities! Example from Nikki: Have your hands reach over to the other ear and touch that ear. Then swap. Count out loud, doing this 8-10 times. -Do partner talk as much as possible. -Use place value mats and base 10 blocks for initial lessons on decimals. Students really buy in. If possible, also use the magnetic base 10’s so that a student can show on the board what they have done. -Connect right away to concepts they know such as slices of pizza and money! Karen’s EA, Quincy, waited around to let me know that this is the first class he’s EVER worked in where when the teacher says; “Ok, it’s time to finish math” the class groans and when she says; “Ok, we can have another 10 minutes of math time” the class cheers! This is exactly why I’m so passionate about teaching math this way – it completely transforms a subject that has caused so much anxiety and fear into one that is exciting and fun and something that children actually want to do! Thank you to Karen and her class for allowing me to be a part of their learning community. It inspired me immensely in just 70 minutes! I first used these mats during my summer camp and found them really useful in grades 4-8 (they reduce the noise of the blocks too, which is a great bonus!). The version on the far left is for primary students, I have not yet had a chance to pilot it in a primary class. The middle version for intermediate grades and the far right version for middle school grades.